A prolific character actress who began her film career in middle age in silent films, but is best remembered for her legion of supporting roles during the 1930s and '40s, Jane Darwell played every thing from kindly neighbors and household servants to gossiping grandmothers, resilient frontierswomen and no-nonsense prison matrons -- sometimes appearing in as many as 20 films in a single year. 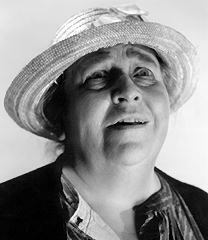 At her best representing Middle America, Darwell even earned an Academy Award as the Best Supporting Actress of 1940 for her performance as Ma Joad in John Ford's THE GRAPES OF WRATH. "This younger generation is going to the dogs." --as Mrs. Schmidt in BACK STREET (1932). "They can't wipe us out; they can't lick us. We'll go on forever, Pa, 'cause we're the people." --as Ma Joad in THE GRAPES OF WRATH (1940).